Since ripped jean became popular few years back, the trend has since developed further to tattered ripped jean look. I do like the slightly ragged look of ripped jeans because it gives this effortless casualness to an outfit. Under normal circumstance I don't think I would purposefully rip up a pair of jeans. However my fav jeans actually ripped at the knees naturally from years of wear. Well, what is a gal to do but to recycle. 1. find a pair of old jeans to try first. I find lighter well worn jeans look the best when ripped. The color contrast between the white thread and the blue is not as great. Select the areas where you want the ripped effect. 2. Cut parallel lines at the locations where you want the ripped look. I avoided knee area because all the bending and stretching motion would make the thread really weak, thus break. I also avoided too high in the thigh area so underwear wouldn't be exposed by accident. 3. 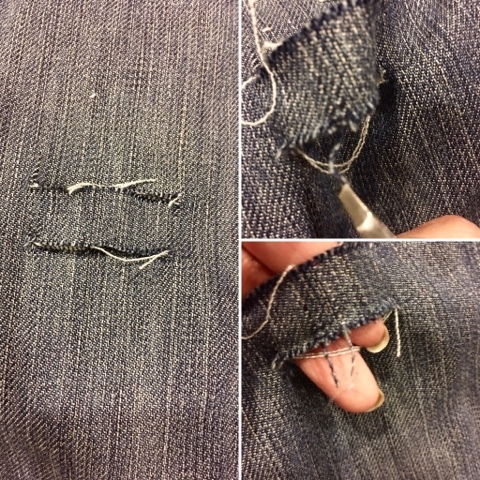 Use a pair of tweezers to take off vertical thread. It's slightly tedious but not too bad. For my pair, I don't want symmetry so I ripped one side and actually cut the other side to make it more tattered. On the cut side, I cut one patch out but left threads on top and bottom area to make it look natural. 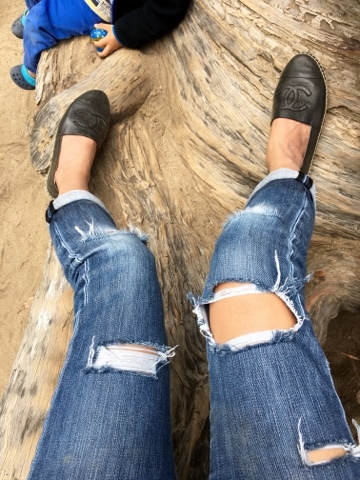 I have seen online where ripped jeans are totally tattered and ripped, which I am not too big of a fan. I am happy with the moderately tattered look which is perfect for the park and activities with the babe. Last but not least, just wash and wear! Washing process will make all the ripped areas look natural.